Kraven’s Last Hunt is original in that, while it stretched across all three Spider-books, it maintained one creative team. J.M. DeMatteis, Mike Zeck, and Bob McLeod make up the team that spin the last Kraven The Hunter story (until, uh, they brought him back to life in Amazing Spider-Man #635 because comic books). By this point, Kraven is a little older and a little wiser and a little more cunning than the Sergei Kravinoff that had been presented as a cookie cutter nemesis for years beforehand. It is revealed that Kraven is actually over seventy years old, and he laments what has life has become. He is an outsider—his home country had not been the same since the Communist revolution, but the country in which he came of age was always an industrial stranger—and the defeats he has perpetually suffered trying to prove his superiority to Spider-Man are crushing him. Knowing his end is coming, Sergei comes up with a final plan to conquer Spider-Man forever. Kraven’s plan is a little more complicated than the typical “I will crush my foe!” evil villainy, however (though it does involve his doing that, heh), as he not only drugs and buries Spider-Man, but also assumes his identity and sets out to prove himself as the hero’s superior. To this end, Kraven’s plan is to single-handedly beat the cannibalistic Vermin, whom Spider-Man had never been able to take down without help. Having beaten and captured the cannibal, Kraven feels he no longer has anything to fear from the hero, even after Spider-Man drags himself out of the grave. 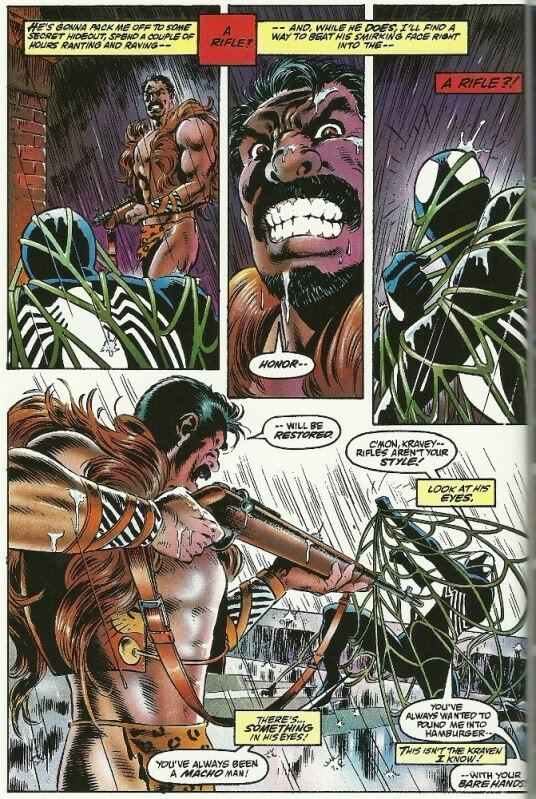 Kraven frees the captured Vermin, forcing Spidey to give chase before Vermin can kill again; this leaves a satisfied Kraven alone, feeling “Peace, calm, happiness. An ending”. With this final victory, Kraven puts his rifle to his mouth and commits suicide. This may come as a shock to you if you haven’t been able to figure this out on your own from the fact that this story focuses heavily on being buried alive, a man-eating monster of a villain, and a brutal suicide scene, but this is a pretty dark story as far as Spider-Man tales go. There’s not a lot of flippant humor with Pete dancing around his foes and keeping them off-balance with his trademark banter. Even at the very start, Spider-Man is in a pretty dark place here. This story follows hot on the heels of Ned Leeds’ (the original-but-not-actually Hobgoblin) death, and when we first see the web-slinger, he’s visiting the makeshift funeral of Joe Face, a snitch, and it only gets darker for him from there. I don’t think there is any coincidence that Kraven’s Last Hunt was published the year after the Born Again storyline that Frank Miller authored in Daredevil; this arc was pretty clearly designed in Born Again’s mold. The narration is another noteworthy point of this story. We get a shifting perspective throughout the story of not just Spider-Man’s and Kraven’s, but also of Mary Jane Watson-Parker’s and Vermin’s. Mary Jane’s point of view is impactful as that of a newlywed living in fear that her husband is dead when she sees a new, more menacing Spider-Man taking his place, but Vermin’s is where the fun really lies. He’s basically a confused, directionless, crazed animal who swings wildly from being hungry to scared to violent. We also get some clues about his background (a background that would later be wonderfully expounded upon in The Child Within, a Spectacular Spider-Man story arc… and I love that story). Kraven’s narrative also reveals a bit about his own past, especially in regards to his family, and it shows that Sergei is obsessed in a love/hate relationship with his deceased parents. His mother was considered insane, and his father was a failure and an exile; the Hunter is torn between being driven to prove himself as more than either while also believing they were better than their reputations. It will never not be odd to me that the culmination of a story called Kraven’s Last Hunt is… a battle between Spider-Man and Vermin. But there it is. Keeping with the tips of the hat to Born Again, it’s kind of like how that story ends with Daredevil fighting friggin’ Nuke. Kraven actually takes his life to close out the fifth chapter of the series, leaving the final chapter to be Pete’s capture of Vermin. To be fair, it is the part of the story where Spidey gets to show he’s able to overcome everything Kraven did to him: he pushes past the fear of having been buried alive, fights past the rage at having lost two weeks of his life, and even “gets his win back” (to use colloquialisms borrowed from the wrestling branch of 411mania) by taking down Vermin without any help. The shifting narration is a lot of fun. I’m not always (or, hell, even usually) a fan of narration that isn’t affixed to a single character, but here all the voices are so distinctive and separate that it works. Especially Vermin’s. Anytime an author can come along, look at a character who has been a stale joke for years and essentially say “I’mma fix this”, I’m likely to be a fan. Kraven is a character who had long been as exciting as wood paneling, but DeMatteis breathes life into him. Suddenly he has a better motivation than “I like to hunt things!”. He wants to conquer Spider-Man, he wants to be Spider-Man, he has affection for Spider-Man. It works. DeMatteis uses a narrative tool for both Spidey and Kraven to show their underlying fears that is really obnoxious to read at points. He will break a sentence down and repeat it adding one word every time. So for a page or two every now and then, you get narrative blocks that read “BUT” “BUT WHAT” BUT WHAT IF” “BUT WHAT IF IT’S” “BUT WHAT IF IT’S TRUE?” It’s. It’s really. It’s really tedious. It’s really tedious to. It’s really tedious to read. The art is not BAD, per se, but it doesn’t entirely feel like it fits the story. It’s a bit too soft and fluid in a story where I’d think the art should mirror the jagged, broken aspect of the story. Zeck and McLeod are a good team, but… maybe just not for this story. As someone who remembers The Child Within from my youth as one of my favorite comic stories, I really enjoyed reading the story that is its predecessor so many years later. This is rightfully a classic Spider-Man tale that Marvel, unfortunately, went back to the well on a bit too often (introducing first a son for Kraven named Vladimir, and then later a whole family of his that resurrects the Hunter, to say nothing of all the subsequent Chameleon storylines that focused so heavily on his longing to avenge his partner). It’s got some clunkiness in the narration that tries to overlap character’s surface and innermost thoughts, and again, the art isn’t ideal. But the redemption of Kraven as a worthwhile character of depth makes up for all that.